Well, early it was but I was very exited, as we had planned to go to Wamm farms. 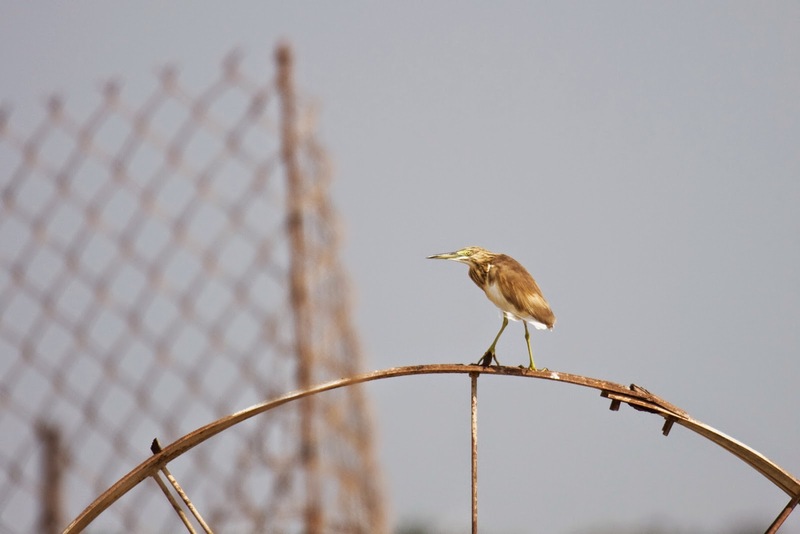 From the UAE-birding site, this seemed like one of the top sites in UAE. Just in time for the sunrise, we arrived at Wamm farms and started with a walk along some of the fields. We immediately saw an Arabian Babbler (I have abandoned adding Swedish and scientific name in the text, see bottom instead) and more would follow. Over the fields, a Marsh Harrier, a couple of shrikes - turned out to be both Turkestan and Red Backed. Both 1cy individuals. The Turkestan were a challenge but eventually you sort of got a feel of the difference between Turk and Daurean shrikes. Both could be found in decent numbers at Wamm farms. A couple of Deser Wheatears were found and Cattle Egretts. 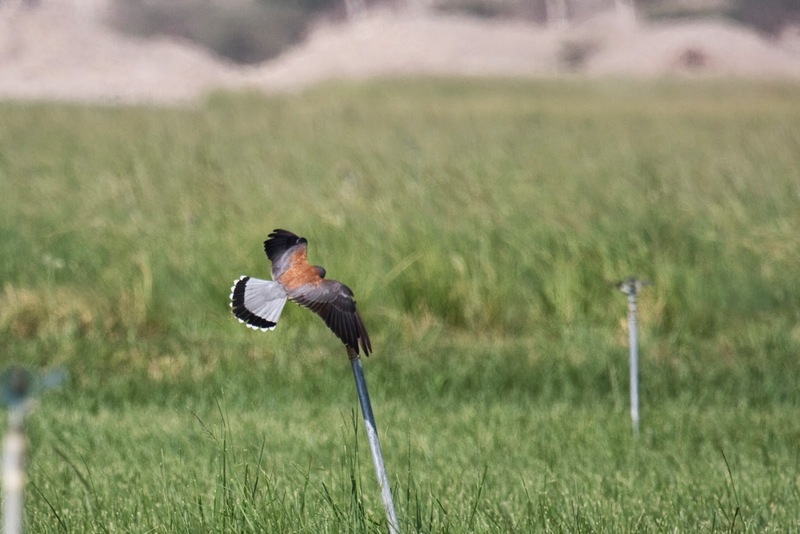 We started looking for Bank Myna, one of the few places in UAE where this species can be found easily. 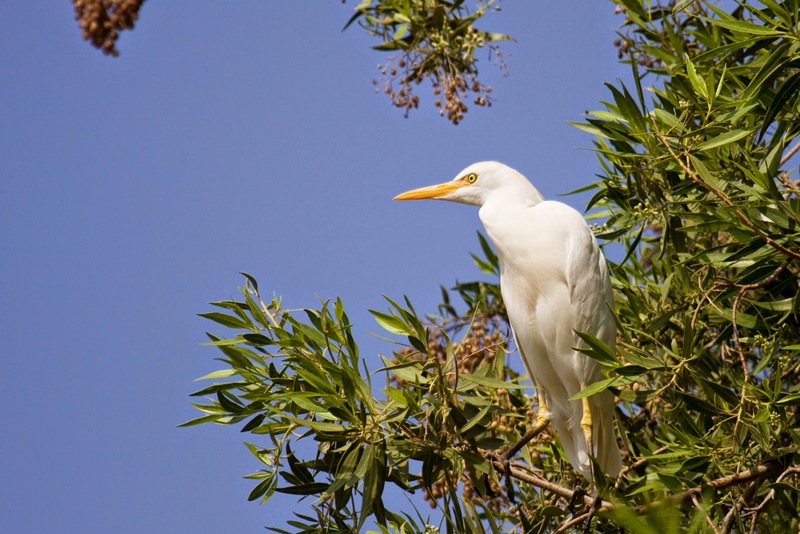 Turned out to be not so easy this time... A White Stork, two Purple Herons and of course all of the "normal" species (like Silverbills, Common Myna, House Sparrows, Sunbirds, Prinias etc.) were almost all around. 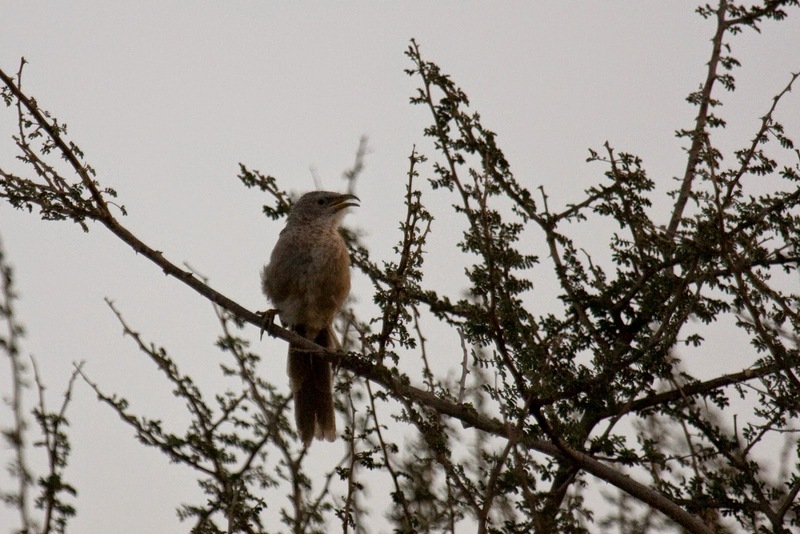 The first bird, which I was able to get a decent shot of, was the Arabian Babbler. Still early in the morning here and not enough light really, to do some serious photography. At least with my old equipment. Going back to the car to take a walk along the edge of some other fields, we saw a Southern Grey Shrike. 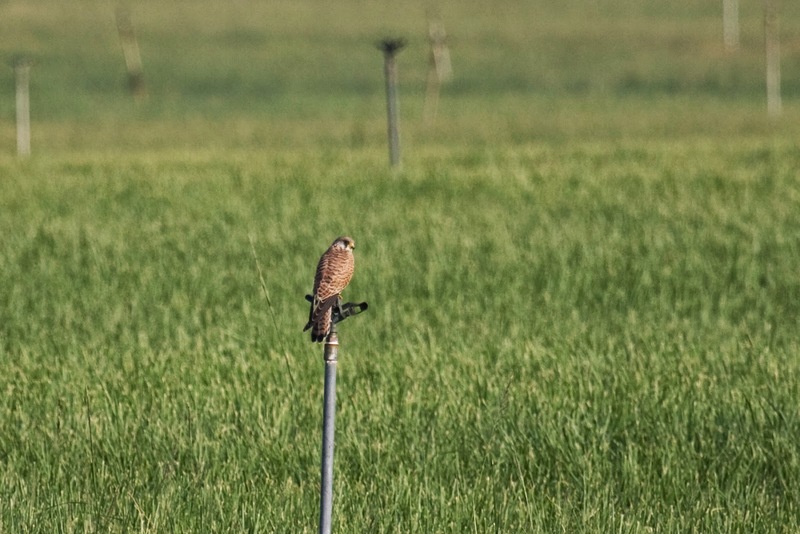 A couple of Falcons were sitting on the sprinklers in western fields, all female, and one could possibly be a lesser but the other ones were definitely common. A little further down the road, another grey shrike was found. 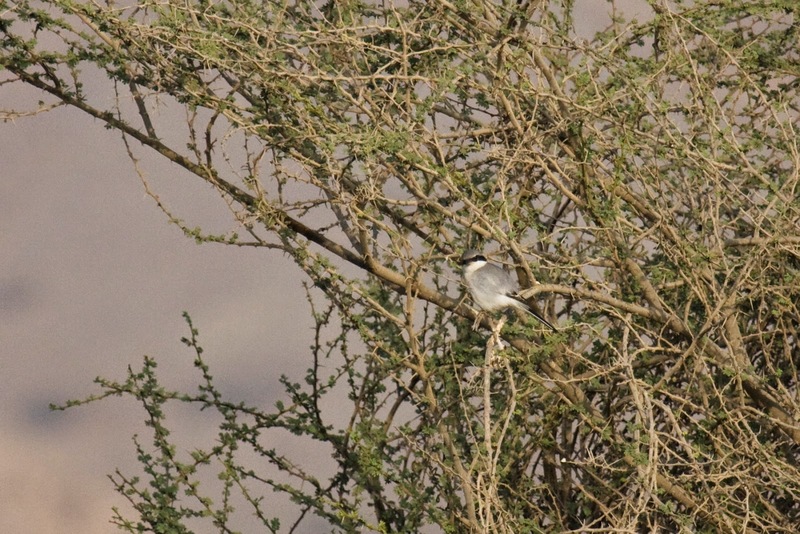 This time, we found a Steppe Grey Shrike. I wasn't sure, at this time, wether it was considered a separate species from Southern Grey, or not. Turned out not, at least not yet according to Clements list. But a nice pallidirostris nonetheless. Well, the Steppe Gray Shrike has a Swedish name and seems to be considered a separate species by IOC but not by Clements, which I currently follow. 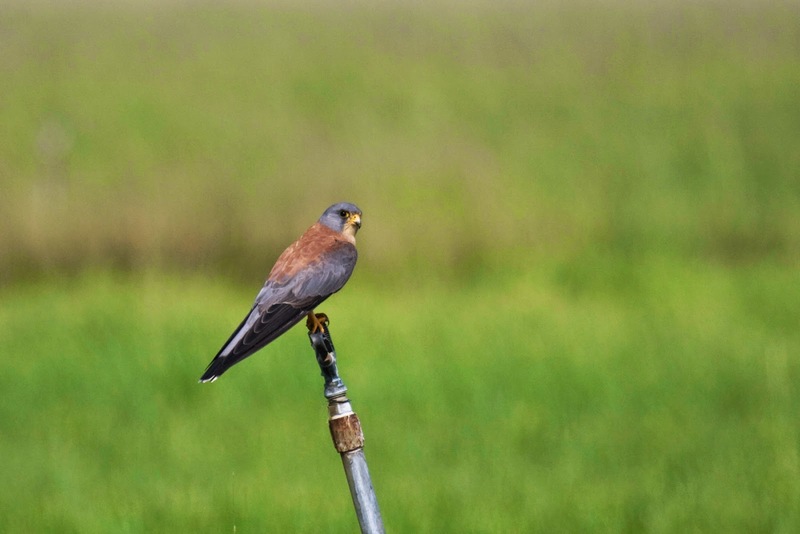 One the way back, another Kestrel was sitting on one of the sprinklers. This one "felt" a little bit more slender, which might have been an illusion, but the long wings were obvious. 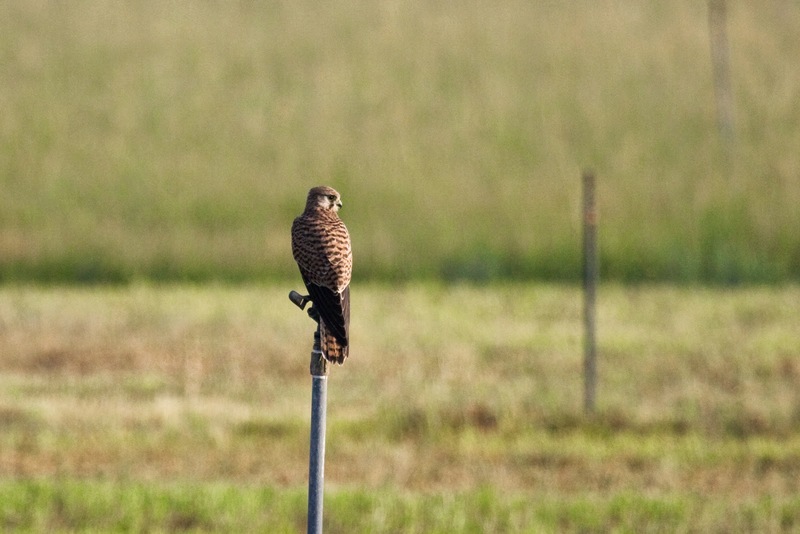 So, even though it was a female, it could quite easily be identified as a Lesser Kestrel. We drove a little bit towards the entrence to the fields. I can't remeber it was before this or immediately after that we finally saw the Bank Myne, but there they were, a couple, among several hundred Common Mynas. 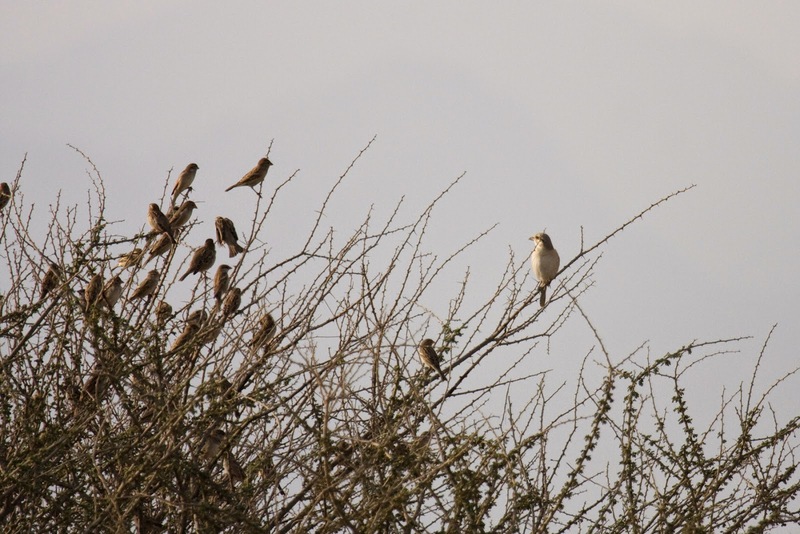 Here we also found some Rose Coloured Starlings, also a new species for me. This had, so far, been a very good start for me. We entered the fields area (where you might need your passport to get in) and walked on to an area with little vegetation on it. But here was a little pond with reed, which could contain something interesting. 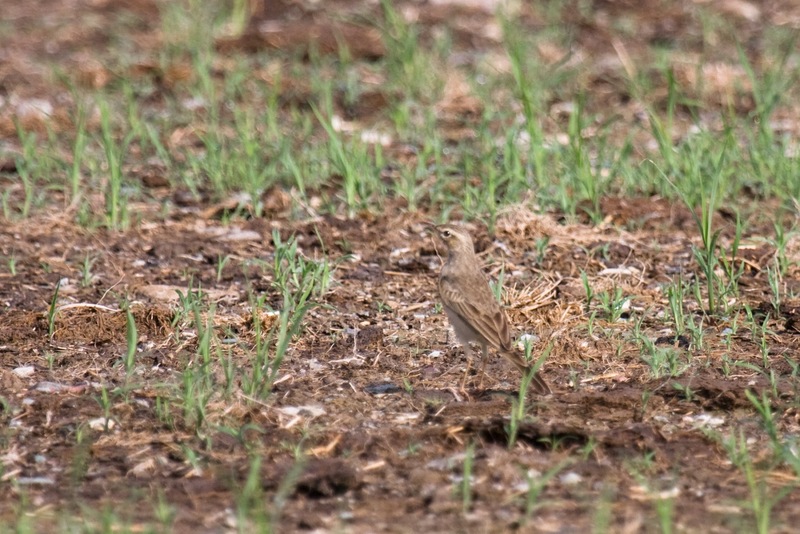 Didn't happen this time though... On the other hand, a little bit further on, both a Red-tailed Wheatear and a Short-toed Lark, both new to me. 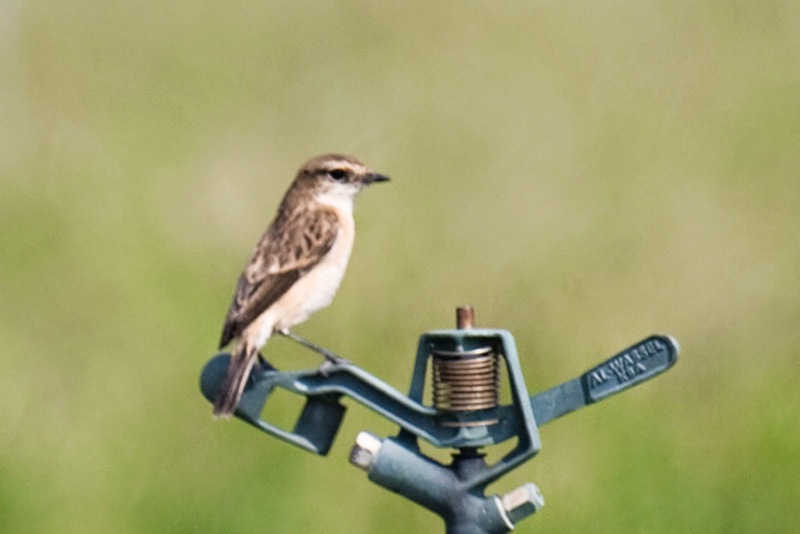 Also some Isabelline Wheatears and another Steppe Grey Shrike, though we debated this one a bit. It wasn't the most obvius one. 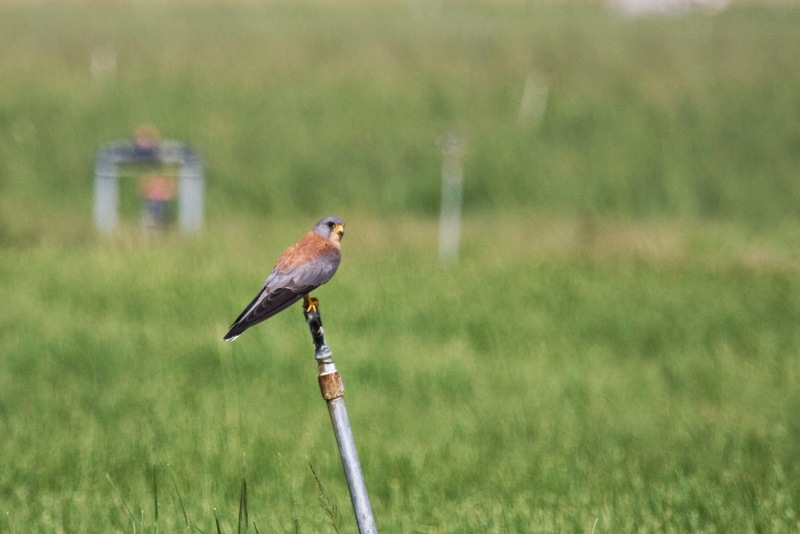 We turned into one of the fodder fields where we almost immediately flushed a pipit. I couldn't recall the call as something familiar and Mark immediately called out a Long-billed Pipit. It flew some one hundred meters and came to a halt on the border fence (on the border to Oman), where we got some nice views in the scope. 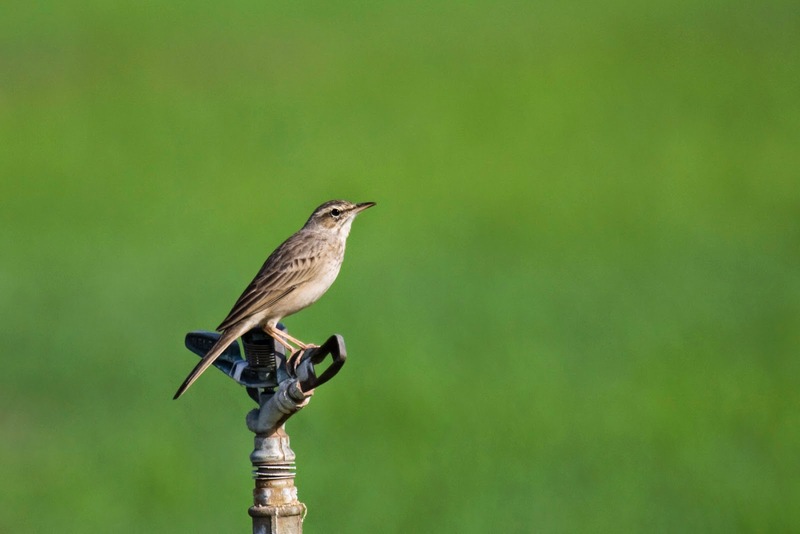 Just a couple of meters further on, another Long-billed Pipit sat on a sprinkler close by. This time I was able to get some photos. Nice bird!! Not that different from Tawny but then again, checking the Collins guide, this is a definite Long-billed. In the high grass in the fields, several snipes were flushed. Most of them common, of course, but then suddenly there was a different call to one of them. It didn't rise quickly in the air, as most common do, but flew off close to the ground, lacking the white edge on the wings. There it was, the Pintail Snipe!! 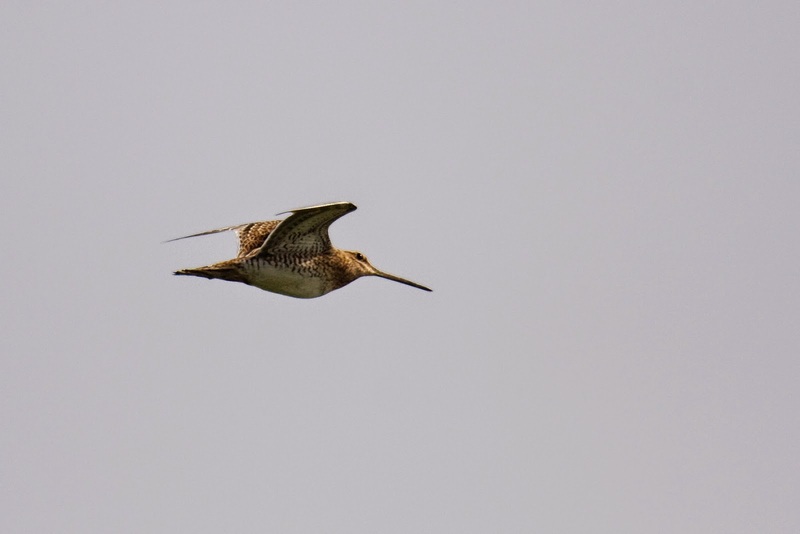 A Common Snipe, but the main attraction in this field at Wamm farms was the Pintail. Perhaps the most intriguing find this day. Though mabye not the most uncommon, but what a beautiful bird. We left the field and closed in on where the cattle are being fed. Of course the Cattle egretts were common here but also some White Wagtails and a Grey Wagtail was also heard. From this field we moved in to the next. I think it was called the goat pit.. 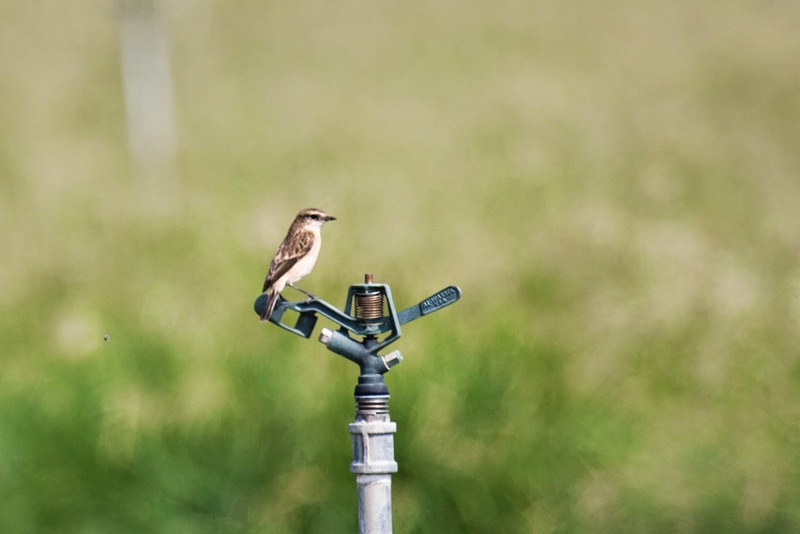 In the goat pit, the first thing we found was a Variable Wheatear. It was expected at this particular place but, just as the one in Wadi Bih last year, it was very shy, hence the poor quality of the photot. 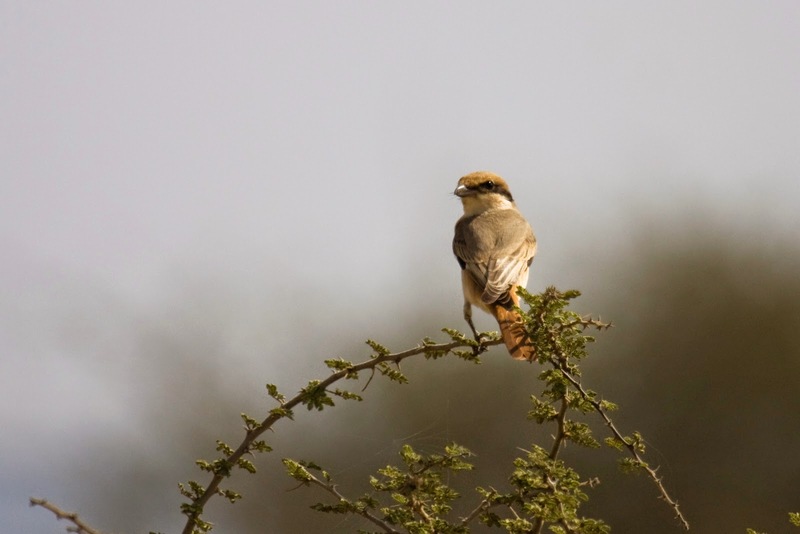 I have also added a photo here of a shrike, which I am unable to set the species for. Moving on, we saw some Tree Pipits, Ortolan Buntings, more Tawny pipits and then we found a Stonechat. Now, this is a quite tricky area as the species has been split into European and Siberian (and Stejnegr's). I had never seen a Siberian before and Mark was pretty sure that this was a Siberian. Well, the photos showed that he was right. All the stonechats I have seen before in UAE have been European som this was a really nice find. Which species is this? 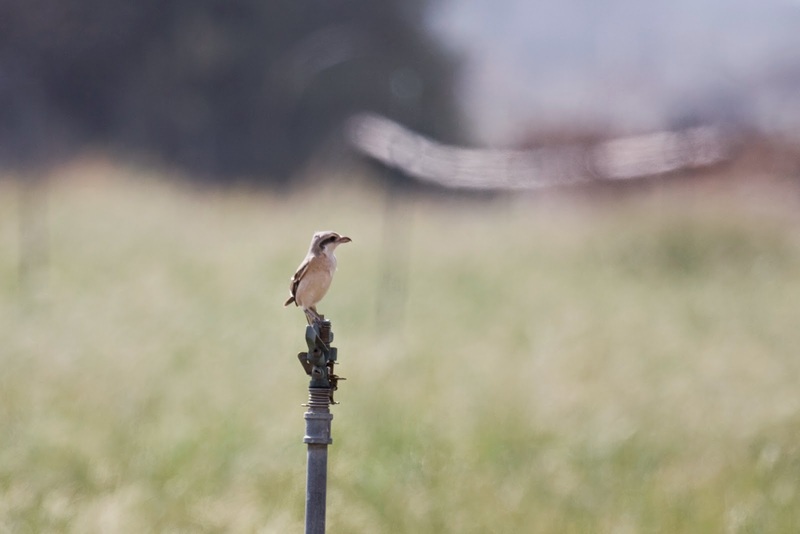 I can't decide if this is a Grey Shrike or an Isabelline type Shrike. This Siberian Stonechat showed a clear rump whithout markings. And all other characters seems to fit well also. 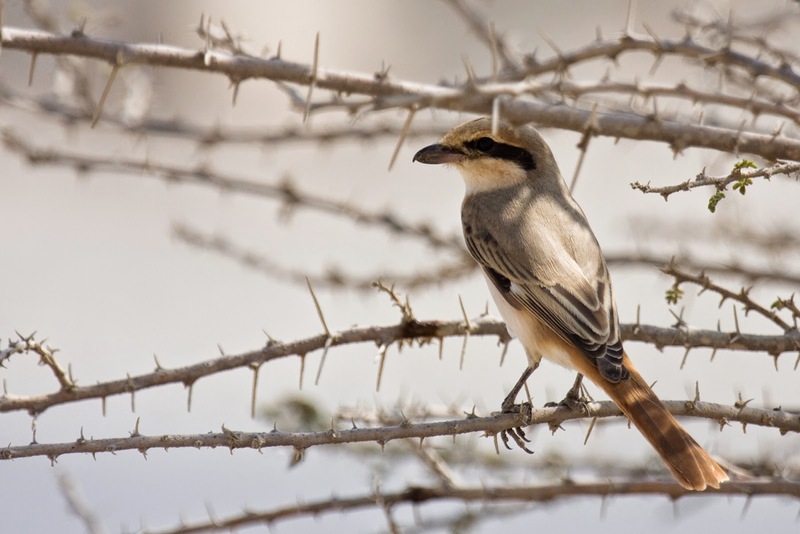 The way back to the car, after finishing this tour of Wamm farms, gave us a Squacco heron and, while sitting in the car, a very nice view of a Daurean Shrike, before we moved on to Dibba harbour. The Dibba harbour proved to be a very good place for terns. About one hundred Swift terns, thirty Lesser Crested terns and 4 Sandwich terns. The Swift were a new lifer for me. The terns were perching on a boat too far out to take photos unfortunately... Lets hope the trip to Oman can give me opportunity to get some decent shots. A couple of waders were running around on the shore. Very soon, they were flushed by some guy who was about to go swimming or something and they flew right past us. 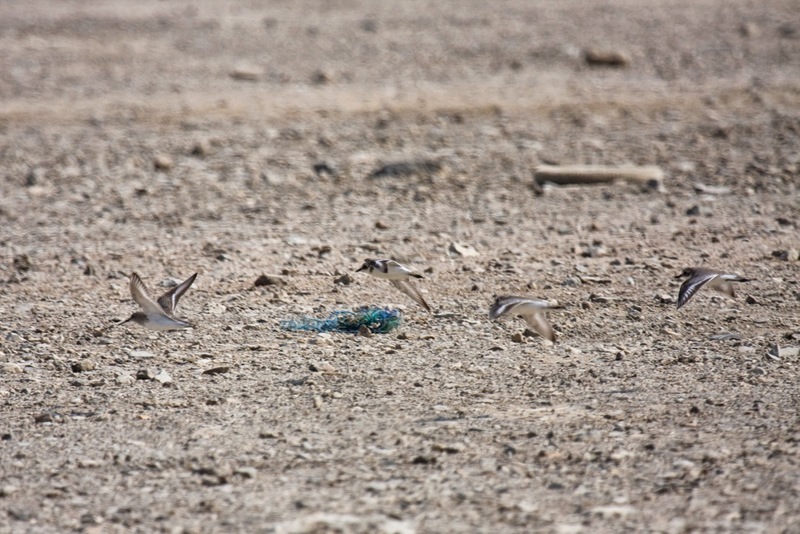 A couple of Lesser Sand Plovers and a Dunlin.